The Group Pensions aspect of our business differentiates itself from much of the competition by offering a quality on-going service commitment. Each prospective member has a face-to-face consultation having had a chance to read the literature and prepare questions. 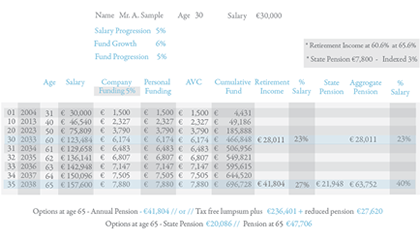 Each member also receives their own personalised award-winning pension model (see sample below) . Services extend to the usual – GROUP DEATH BENEFIT AND INCOME PROTECTION PRODUCTS. Having struggled in the past with poor service levels from some life offices, we now evaluate each office investment house in relation to its performance and service levels and have a short-list of a small number of companies able to live up to their promises. We have a small but growing bank of clients in this area who regularly express satisfaction with the ease of doing business with Moneywise. We aim to keep charges as low as possible within this service commitment and work on both commission and fee-paying accounts. Contact Alan Morton alan@moneywise.ie for further information. Moneywise Financial Planning Ltd, 16 Fitzwilliam Square Dublin 2, Ireland.